If you’re ever stuck wondering just what stitch to use to fill a leaf and you start browsing through a stitch dictionary for a little help, you’ll find out that there’s a regular glut of filling stitches that work well for leaves. But there are two stitches in particular that I think make really nice leaves: the fishbone stitch and the raised fishbone stitch. If you have trouble creating a nice looking satin stitched leaf, never fear! The fishbone stitch and the raised fishbone stitch will come to your rescue. They both create a satin-stitch-like filling, but because the stitches overlap in the center of the leaf, you get a nice, subtle spine right down the middle of the stitch. 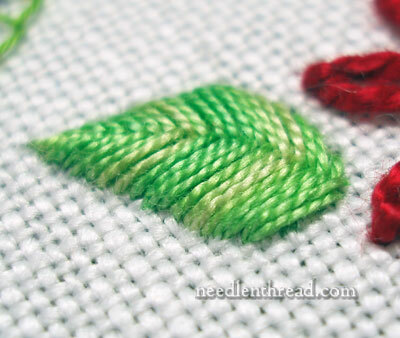 Today, I’ll show you how to create a raised fishbone stitch leaf. Incidentally, the different between the fishbone stitch and the raised fishbone stitch is more than just the fact that the raised version sits higher on the fabric. It’s also created a little differently – it is stitched practically backwards, when compared to the movement of the regular fishbone stitch. But you can see in the photo above that the raised fishbone stitch creates a nice, plump leaf that’s quite pretty! If you’re looking for other embroidery stitches, please feel free to check out the rest of my embroidery how-to videos! Great video – you’re right, that’s definitely not your usual voice(! ), but it’s all perfectly audible so definitely not worth re-recording. What a great stitch! I had not seen this one before. These videos are such a help, Mary! Funnily enough I was stitching leaves last night using this stitch! Sounded just fine to me Mary. I love this stitch and use it often. Your video is nice and clear. Thanks. Perfect timing! I have a crewel project that has several leaves. I look forward to trying this technique. I’ll be working on it on the long ride home from Maine to Florida so I’ll have plenty of time to perfect it! i am very happy for this site as i am able to learn lot of stitches to embroider neatly.the videos are very good & easy to understand how to do the stitch.very much thankful to you. That is on my to learn list. I think it looks so pretty. Thank you for the video! contributions here…It is very difficult to to buy a book called, A-Z Embroidery Stitches, but I find your documents have many important details. I have stumbled around trying to make my Ghiordes (sp??) knots fluffier (Ah-Ha! Six strands of DMC!! ),as well as making the actual knots. I didn’t know it was also called Turkey Work. Thank you for making a video for it! thank you.I liked the raised fishbone stich. I have just had a play with this, love Love LOVE it. Thanks! Hi Mary, Thanks for the video. I have done the flat version of this stitch before, but it will be great to add some height in my future projects. Rank beginner’s question: how do you get the variegated leaf effect, balanced so perfectly? I found your website this week and I´ve done almoust all these tutorials. You´re a born teacher. I don´t understand everything what you say or write, but I watch videos. Thank you very much!! You have done very beautiful and stunning embroidery projects. Really, they are so amazing. great video. now i can do it easily without any doubt. thank you. A big thank you Marie for taking the time to make this video for this item. It seems so easy and so clear with you. A pleasure to follow you. Wonderful! Thank you! Your voice didn’t sound weird to me, just a bit muffled. Thanks again! Will come back for your other offerings. Os bordados são muito lindos. Sou uma apaixonada por bordados e gostaria de receber as novidades de Mary Corbet. Parabéns!!! Hi Mary, I have been watching your videos since about, 2011. I love them! 🙂 You explain and show how to embroider different things so nicely! 🙂 I do have a question though… I went to sew this and I couldn’t get it to ‘go right.’ Like, it tangles and ends up being flat and each one of the leaf stitches are all spaced apart….Help?? Hi, Natalia – Perhaps your thread is twisting up as you stitch? If so, drop your needle towards the floor now and then and just let the thread hang until it untwists itself. Another problem could be that you’re pulling each stitch too tightly. Just put enough tension on it to let the stitch rest on the fabric nicely. Thank You Thank You for your great video and your site. You are fantastc. I am Brazilian and I love crafts. This site has beautiful embroidery. Congratulations !. hola, gracias por tus videos, me han ayudado muchisimo!!!! I cannot see any of the videos. Do you know what plugin is used to post the videos? Hi, Melissa – they are YouTube videos, so you just need to make sure flash is updated. I quilt, embroidery, and other handwork. Your tutorial’s are amazing. I have learned so much and it is so clear the way you filmed each video. Thank you for your site. Your videos make it so easy to follow instructions. Thank you.